Edited to add: So honored to be selected by Kelly Latevola for her Casing Genius column. I think we can agree that the term "genius" is open to interpretation here, but this is fun, and I am grateful to Kelly. Kelly does fabulous work on her blog, You and Your Big Dreams. Please check out the fabulous card she posted today, and if you have a moment, tell her how great it is. Now I want to CASE Kelly! My first attempt at drawing and watercoloring. It started when I decided that I "must" have a pineapple stamp and found a few that I loved and then decided to try a few designs on my own. Think I may need to buy that pineapple stamp! Canson Watercolor Paper (any watercolor paper should be fine). 1. Cut paper and score to make A2 card. 2. Run folded card through Big Shot. Be careful to use plates that are not scratched because the scratches will transfer to the paper. 3. Draw fruit with pencil, but do a better job than I. 4. Paint, but do a better job!! I found samples on pinterest to inspire. 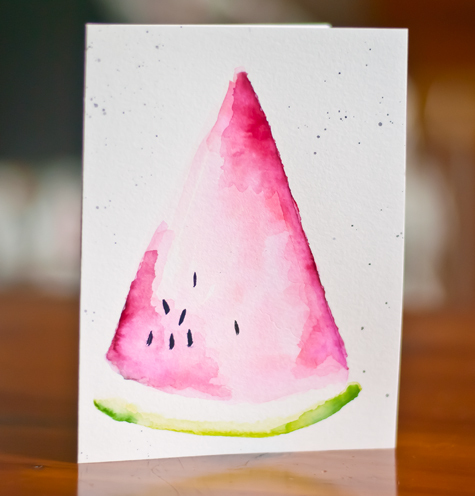 Just search for watercolored fruit. There are thousands! 5. Add watermelon seeds with Black marker. 6. Painted the black marker on a block, picked up with a wet paint brush and flicked on cards to add a few splatters. 7. Just be happy that you tried. I can find all sorts of reasons to criticize these, but I've always wanted to do this and I'm happy I tried. I'll practice and show you more as I, hopefully, improve. Fed Up Challenge: It's going great. I didn't post an update yesterday because I've run out of things to say. I'll post a final update later this week, when the 10 day challenge is over. You are much to hard on yourself! I love how these fruits turned out! I think you should continue drawing and watercoloring!! You may just find another creative outlet and use for your supplies!!! You drew these? Freehand? Wow!! I love these. They look amazing! 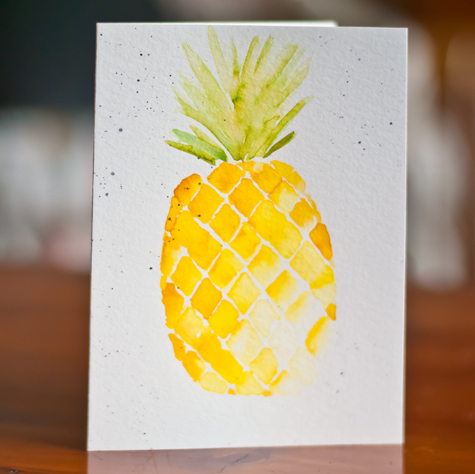 You do NOT need to buy that pineapple stamp. Gorgeous!!! Love!!!! !hy did you run the card through the bigshot? Thanks Jenn. I ran the blank cards through the Big Shot before painting, but forgot to do it after they dried. I need to do that before I mail them! WOW, just beautiful! No need for a pineapple stamp..... or any other fruit stamps for that matter! I'm flabbergasted that you could criticize these at all! When I saw the watermelon the beauty meter inside me went way up. Then the orange slice had alarms going off. Finally, the pineapple was simply too much and I had to deactivate the beauty meter. I'm not kidding. These are amazing, Joan. These are about the most amazing cards I have ever seen. 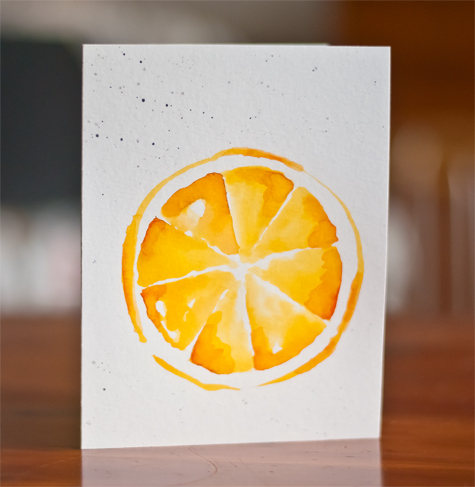 Please don't buy any fruit stamps, and please don't stop watercoloring. These are very well done! Wonderful drawing and watercoloring. Keep it up. Love what you have done, very talented work! Your Fed Up Challenge has had me laughing what you have written! Well done you and keep going with the challenge! Oh no you didn't - even think about buying that pineapple stamp! Really gorgeous, Joan... I couldn't choose a favorite they are all just juicy and delicious! Oh yum! Those fruit-themed cards look so delilsh! They're all so beautiful! I confess to being a bit confused as to why you run these through the Big Shot though. could you please elaborate? I don't see any embossing, but then I am known to be quite dense. sorry for being clueless over here. so proud of you for your sugar-free challenge! Thanks Jennifer. I ran the cards through the big shot to flatten the bumps in the watercolor paper because I like that smooth finish! It also makes for a crisper card -- the fold is nice and thin. Joan, your watercolor creations are simply amazing! Now you need to frame them. Oh yeah, they need to be framed! Beautiful watercoloring! So happy to see your work at the Kelly's feature! These are beautiful! So impressed that these are your first attempt! Very cool!